Historic US 281 Spring Branch Bridge, Photo by Tom Hackleman of Vantage Drone , a Texas Vantage, Inc. compamu. 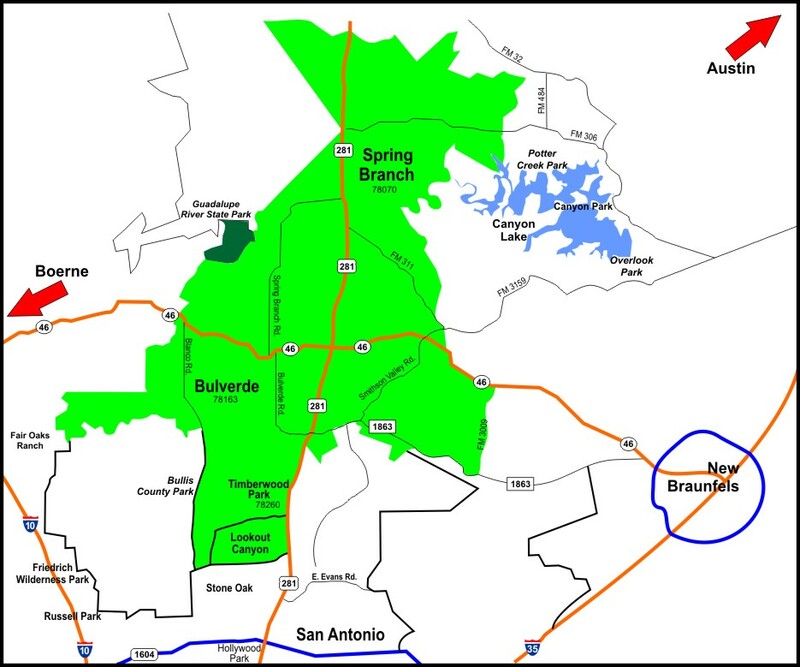 Bulverde/Spring Branch is conveniently located on US Hwy 281, less than 7 miles north of San Antonio, the 7th largest city in the nation. State Hwy 46 and an array of farm to market roads serve this area as well. We are also equally located approximately 20 miles west of the City of New Braunfels, east of the City of Boerne and south of the City of Blanco…truly a regional crossroads of commerce. Plus, many of our local companies find a Central Time Zone location to be a great advantage. Located on US 281 (north-south system) and SH 46 (east-west system), we are 14 miles to Loop 1604 in San Antonio, 22 miles to IH-10 in Boerne, and 21 miles to IH-35 in New Braunfels. SH 46 is becoming San Antonio’s “outer loop”, connecting the Texas Hill Country communities of Bandera, Boerne, Bergheim, Bulverde, New Braunfels, and Seguin with Bulverde located right in the middle of it all. 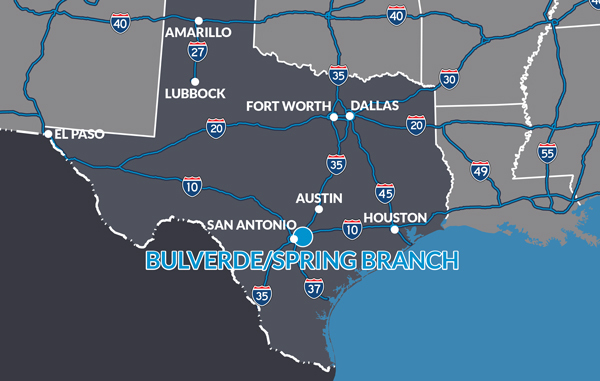 Bulverde/Spring Branch is conveniently located on US Hwy 281, less than 10 miles north of San Antonio, the 7th largest city in the nation. State Hwy 46, FM 1863, FM 306 and an array of additional farm to market roads serve this area as well. We are also equally located approximately 20± miles west of the City of New Braunfels, east of the City of Boerne and south of the City of Blanco…truly a regional crossroads of commerce. Plus, many of our local companies find a Central Time Zone location to be a great advantage. 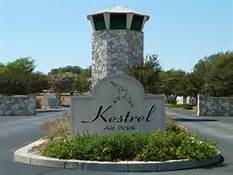 Commercial air travel is available, only 22 miles to the south at San Antonio International Airport. It is the largest airport in South Texas consisting of over 2,600 acres with two terminals, two all-weather air carrier runways and one general aviation runway. More than 8.5 million passengers fly into and out of historic San Antonio each year, visiting more than 30 non-stop domestic and international destinations on 11 airlines providing an average of 260 daily departures and arrivals. Airlines include AeroMexio, Air Canada, Alaska Airlines, Allegiant Air, American Airlines, Delta, Frontier, Interjet, Southwest, United and Volaris Airlines. Leading air-cargo and package-express carriers also are available. The San Antonio International Airport itself is an economic generator for the region, supporting over 97,500 jobs and providing nearly $1.6 billion in annual earnings for workers and proprietors. 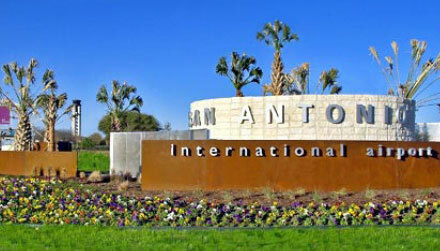 The airport is owned and operated by the City of San Antonio. Commercial air travel is also available 74 miles to the northeast at Austin-Bergstrom International Airport. This airport serves 10 million passengers each year on 18 airlines and now has 60 nonstop direct flights to destinations in the U.S. and internationally. Airlines include AeroMexio, Air Canada, Alaska Airlines, Allegiant Air, American Airlines, British Airways, Condor, Delta, Frontier, jetBlue Airways, Norwegian, Southwest, Sun Country, United, Vacation Express, Virgin America, Volaris Airlines, and ViaAir. Leading air-cargo and package-express carriers also are available. Leading air-cargo and package-express carriers also are available. 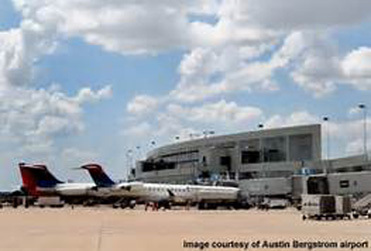 Austin-Bergstrom International Airport supports over 40,000 jobs, over 3,000 at the airport itself, and contributes over $2.4 billion to the local economy. The airport is owned and operated by the City of Austin Aviation Department. Austin’s airport is self-supporting, generating revenue to cover its operational expenses. 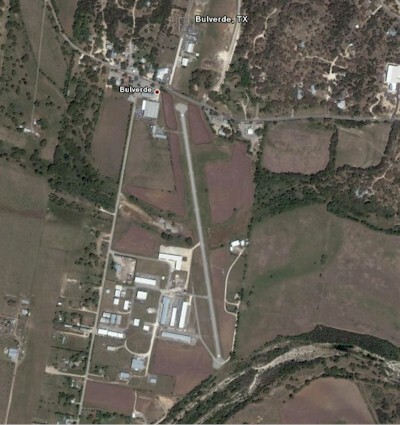 There are also several small privately owned airports located in the Bulverde/Spring Branch area two of which have public access such as Bulverde Airpark and Kestrel Airpark. Central, Consolidated, and Roadway Express are based out of San Antonio but serve our area. Southeastern has a local terminal in Schertz which is located just 22 miles southeast. FedEx has a large freight terminal serving the Bulverde/Spring Branch area and Comal County that is also located just 22 miles southeast.